G&P M4 acting like it's on safe when switched to auto. Evening gents, wondering if any of you who are more technically aware than myself can help diagnose my problem. Brought the gun to a tech to have the spring changed, learnt from him there were apparently some broken parts inside, I'm not going to pretend I remember the exact details but I vaguely remember something to do with the piston, piston head and maybe the tappet plate? 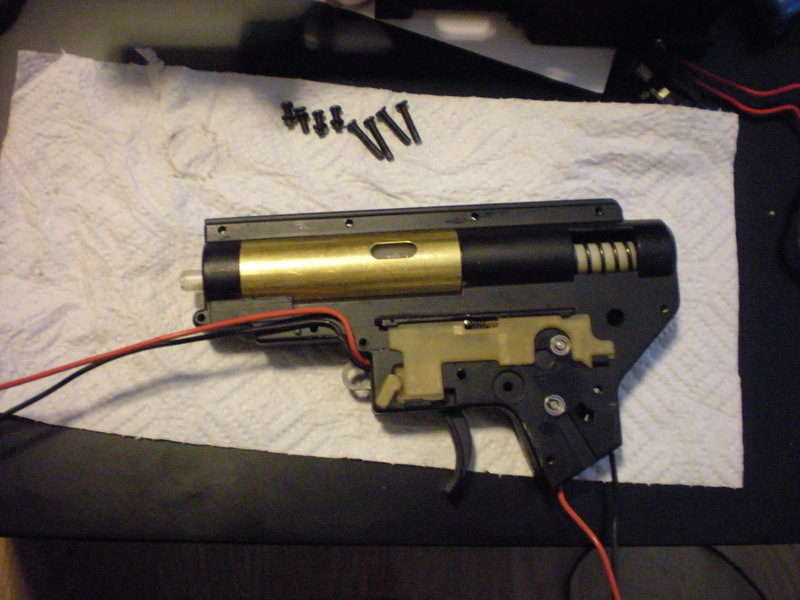 Anyway he had quite a time putting it back together, apparently the gear box wouldn't sit far enough back in the lower reciever, and there was an issue with the trigger spring. He got it together, worked on full auto etc during testing. I haven't used it since, has been on top of my wardrobe awaiting me getting to a game. I'm wondering what could be causing this, and if using it as is on semi would potentially cause damage it? is there a spring on the selector plate? Could feasibly be a damaged selector plate shifting the cut off lever right in the way of the switch block. The guy they had working on it was a bit of an "apprentice" I think, I was able to sit in the small shop and watch while he kept asking the boss for help so the screw idea might not be out of the realms of possibility. I don't know how that can happen but if it does happen, then the selector plate can't move back enough to raise the cutoff lever fully. When that happens it is right in the way of the switch trolley (thanks SD), and you can't pull the trigger. There is no harm using it on semi. That's the word I was looking for. Cheers. This. Don't go fixing problems that someone else got paid to fix. I've got a similar problem with my G&P m4... On semi auto it will do single or three shots randomly. After a few burst the trigger locks up but if I flick full auto it seems the 'clear' then is ok for a short while. A guy at the site suggested installing a mosfet. His logic was something along the lines of the gun not fully cycling on semi auto and a mosfet would help it 'reset'. To be honest he may as well have speaking a foreign language! I'm planning to take it to a local tech to try and resolve it! Unfortunately seeing as I left it on top of my wardrobe for so long before checking it again I'm out of their "7 day guarantee on repairs"
So I'm thinking is this more of a trigger related issue? To clarify, trigger won't go back and acts as if its on safety, a VERY hard trigger pull that would make you think you were going to break it, causes the trigger to snap backwards and it fires. On releasing the trigger you have to then repeat the hard trigger pull to get it to go back. Trigger is however smooth as anything and very light on semi? No, it's what I said. Forcing the trigger makes the trolley bend and snap out of the way. Don't do it, it will wear down the trolley. With the upper receiver off, look down on the gearbox's left side. When you move the selector, you see the selector plate moving between the GB and the body. Put it to auto, and reach down with a screwdriver or something to move the selector plate a little further if you can. If you can, then you will be able to pull the trigger easily. You don't need the battery connected for this. Don't suppose you know what parts they fitted ??? Right lads pushing the selector plate back a smidge when in the auto position does indeed make it shoot automatically as it normally should... Problem is then when I put it into semi the problem re-establishes itself meaning the plate has to be pushed back each time. Also, sometimes when switching back to Semi, semi sometimes locks up but is fixed by going to safe and then back to semi. From what I can see the selector plate isn't going back far enough. There does look to be a cut-out for the rear body pin so I'm assuming this isn't causing the problem. Unfortunately I don't know which parts were fitted but from what I can see down the side of the gear box ( I cant get the gearbox out of the receiver yet as I've lost my long handled screw driver for taking off the buffer tube screw) its pretty much a case of this selector plate not going far enough back. About half way along the selector plate there is a small cut out with a spring inside it, the spring itself seems to be bent with the end which is nearest the front of the gun going in towards the gear box. Could this bent spring be the problem? Hoping this could be as simple as getting someone reputable ( or possibly even myself if its easy) to fit a new selector plate if it turns out this one isnt compatible. I know its quite a cheap one, and neon yellow if that helps in identifying it at all? Pushing back the selector plate manually was just a test so you can see that the problem is what I said in the first place. Not a fix. If you insist on trying to fix it yourself, you need to add some material to the selector plate. Here you go. Disregard that it's actually a G3 box, and your selector plate will look a bit different, the relevant parts are the same. You need to add material to that part where the screwdriver is pointing. On the left side of the little spring there is the cutoff lever. As the selector plate moves to the right, it pushes that lever to the right, raising the cutoff, allowing full auto. You need that to happen on smaller movement on the selector plate. Options to add 1-2mm of material: plastic welding, epoxy, molding in a piece of metal with a soldering rod, superglue+baking soda, etc. Has that plate been dmr'd already ?? Selector plate is not defective. OP said the gearbox is not it its place, but moved backwards for some reason. Maybe incompatible GB, I don't know. That is the cause of the problem. @SD: The photo is just a googled one, it must come from a "how to limit to single only" thread. In Germany no autofire capable airsoft gun is allowed by law. Retailers there replace the selector plates with these metal ones. Maybe cheaper to make them in smaller quantities, I don't know. I'm off out to the shops just now to get a long handled screwdriver so I can get the gearbox out of the receiver and some expoxy to add some material to the selector plate. Will report back and let you know how I get on gents, thanks for the help so far ! Sorry for the delay in reporting back - motor plate screw stripped and couldn't get it out. Had the gun apart and I think the problem lies with the selector plate being incompatible. I think its an SHS re-inforced type, and the extra meat might be causing too much resistance? 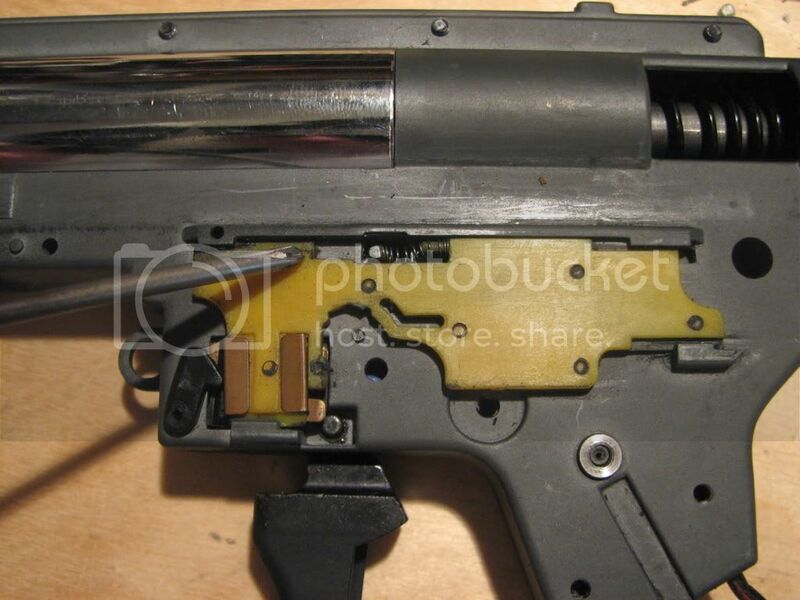 There were shavings of plastic coming out of the grooves that hold the selector plate on. Anyway I've just ordered a G&P low resistance polymide selector plate from firesupport so will see how I get on with that! On a side not, anyone know where I can get replacement motorplate screws? Saw on a yank forum about them being M3 machine screws , does anyone have any experience with that being true? Cheers duck they are actually bolts, was repeating the slosh I'd read from the otherside of the pond lol.